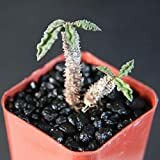 Euphorbia decaryi growing subshrub succulent of the genus Euphorbia also known as Euphorbia decary, Euphorbia decaryi perennial evergreen used as ornamental drought tolerant plant, can grow in subtropics or dry tropics climate or as house plant and growing in hardiness zone 11+. Leaves color dark green or purple the leaves hairy and little flashy in linear shape with wavy margin. Flower color brown or yellow-green with two sepals. 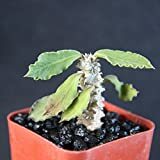 Euphorbia decaryi decary exotic madagascar rare caudex succulent cacti plant 2"
Euphorbia decaryi rare succulent cactus plant agave #2"